14 " h x 14 " w x 1.5 " d |2 lbs. 0 oz. 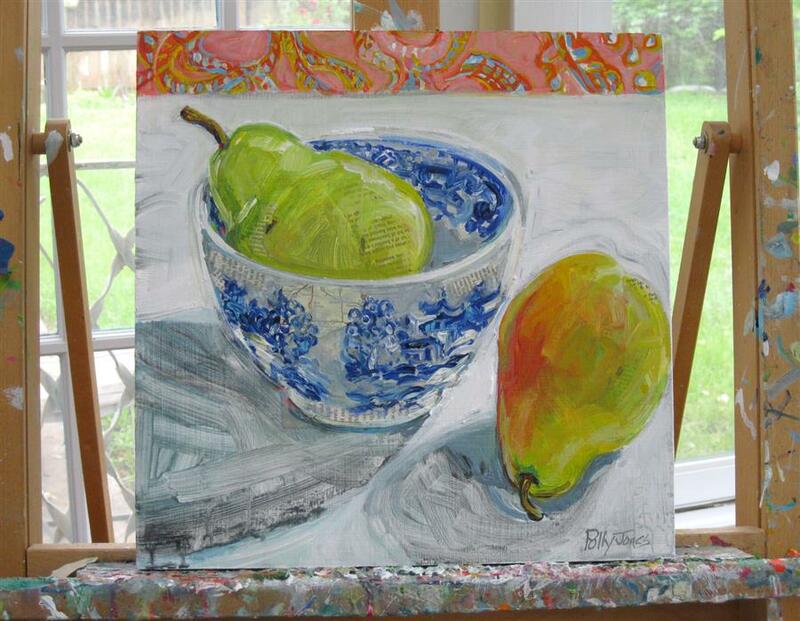 I often paint pears and blue willow. 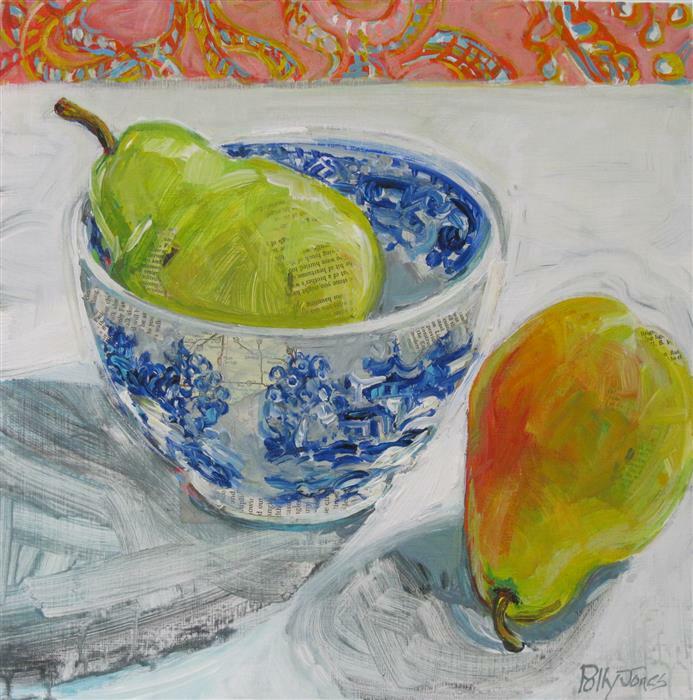 Pears are so sensuous and blue willow is a favorite because of the colors and for its story. The blue willow pattern tells of a pair of thwarted lovers who die and are transformed into birds that can escape. This piece was made with acrylic, acrylic mediums, and paper. The artwork is on a cradled wood panel with finished edges. It comes ready to hang. 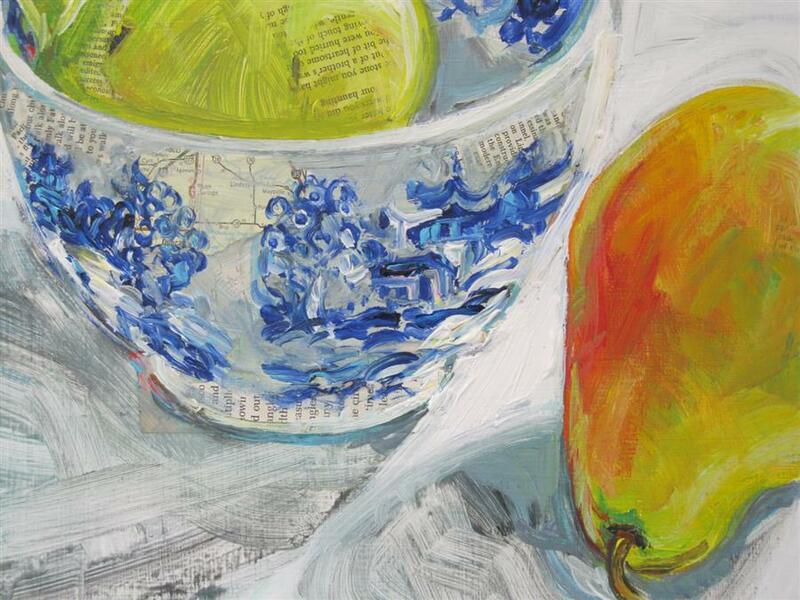 Polly Jones’s still life paintings are inspired by a sense of joy in the everyday. 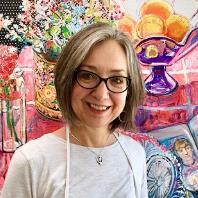 Her life journey thus far has been very serendipitous, with everything leading her to the life of an artist. 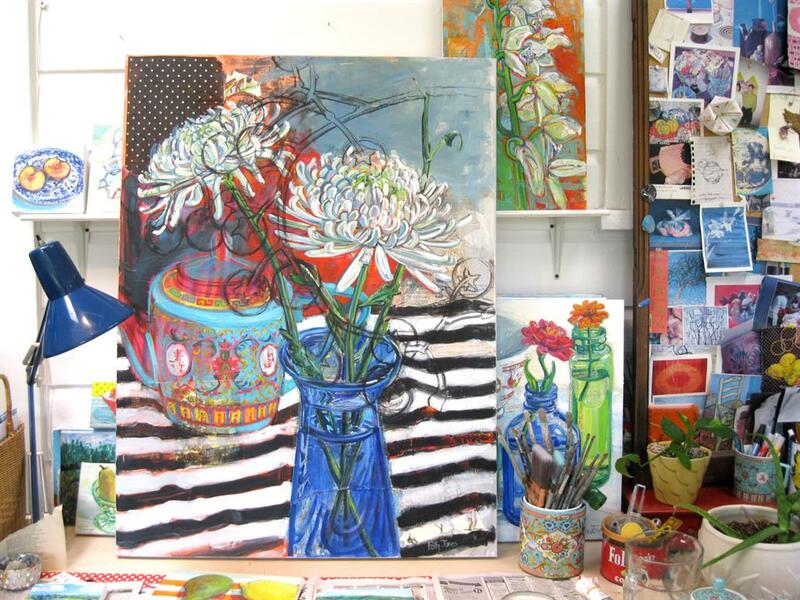 All aspects of the work are pleasing, from the lovely objects she chooses, to the warm colors and fun perspectives. 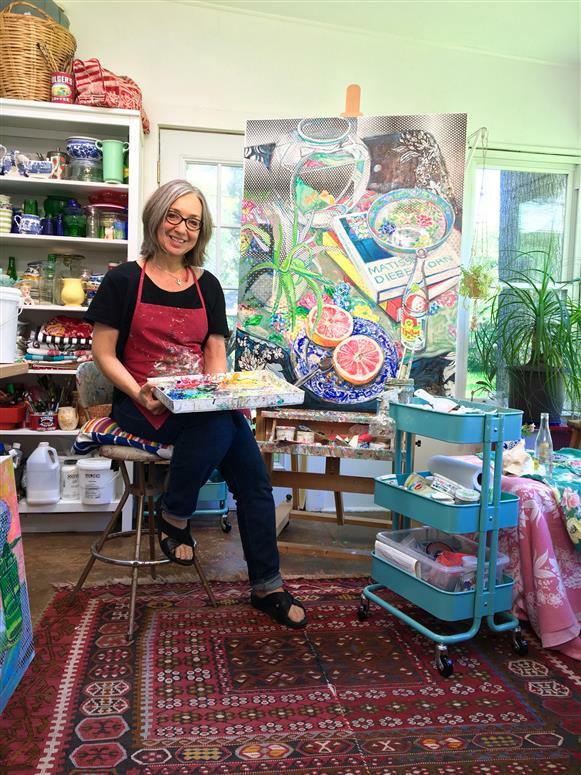 She paints at home in a former sun porch converted into a studio full of windows, which she shares with her husband who is also an artist. 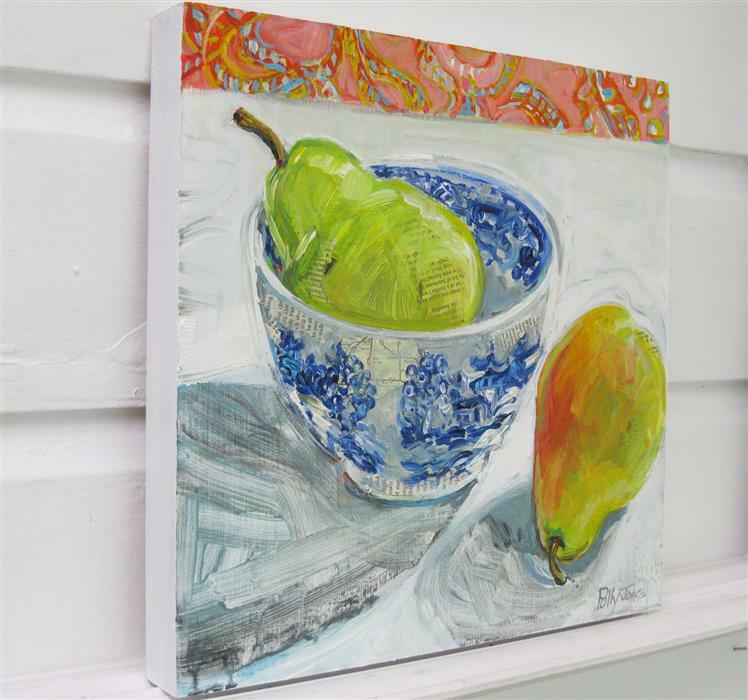 Her paintings depict the timeless and traditional subject of the still life in a contemporary way. Although the work has subtle art historical references, drawing inspiration from impressionists such as Henri Matisse, it feels very much her own. Polly incorporates mixed media and collage into the art using maps and pages of old books to create an added layer of meaning and dimension. The work feels like a satisfying memoir, made up of home, family, love, and an appreciation for the small things in life. We offer free shipping in the United States on all our artwork. Additional charges may apply for international orders. Your artwork is expertly packaged with our custom art boxes. No peanuts, no mess. Try any piece in your home risk-free: We want you to love your new art, so if a piece doesn't quite work in your space, return it within seven days of receiving your order and we'll issue you a refund for the price of the art. Art must be returned in its original packaging. We will pay for return shipping on pieces measuring up to 50 inches on the longest side. For larger artwork we charge a return shipping fee of $300. Customers located outside of the United States are responsible for the cost of return shipping and any duties. For pieces shipped outside of the United States, please see our complete return policy here for details. We are a unique online art gallery offering affordable art for sale from the nation's most talented mid-career and emerging artists. Our expert panel carefully selects each artist and piece we exhibit so that you can purchase artwork with confidence. 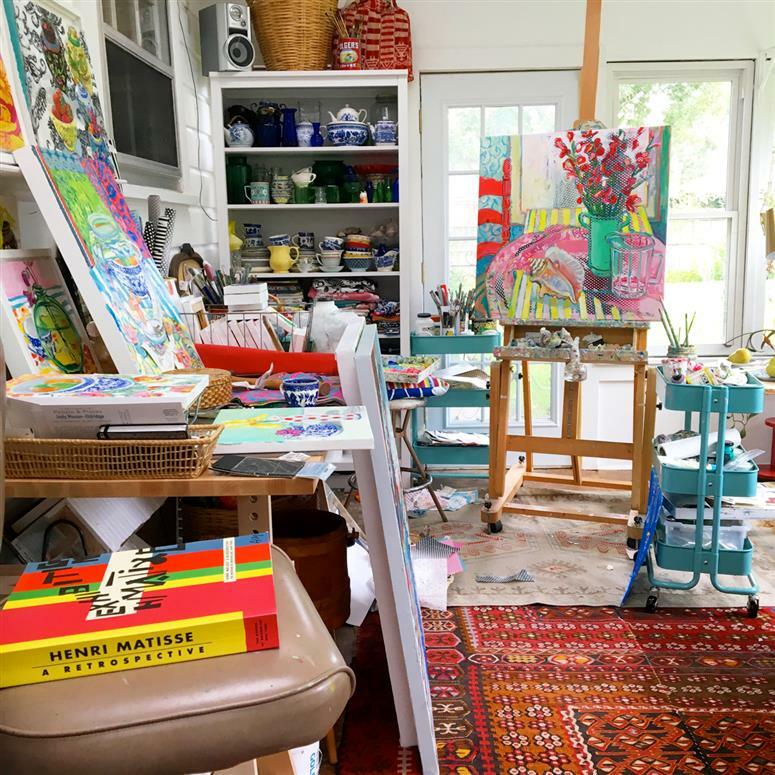 Art is shipped directly from artists' studios in custom-built boxes. No peanuts, no mess. Artwork arrives at your doorstep ready-to-hang! Free shipping, free returns.